You are currently browsing the category archive for the ‘Photography Equiment’ category. I returned a few weeks ago from five weeks in India leading a National Geographic Expedition photo group to Rajasthan (great fun, great group!) and then I was photographing tribal groups in Orissa and Chattisgarh for three weeks. I wore my neck brace 24/7 (see this post). I felt like a robot since I had to turn my entire body whenever I needed to look to the side; but interestingly, only a few people ever commented on it. I think most tribals thought the brace was a fashion statement (and I was accessorizing with a buff and scarves). Well, as I wrote in the previous post, I never found a suitable lightweight photo vest for tropical weather, so I tested travel vests and decided on the Magellan Travel Vest. It failed “the photo vest test”. In its defense, the Magellan travel vest is not meant to be a photo vest. However, it also failed “the travel vest test”. I love the fabric and cut of the vest. Yet for the pockets to be truly useable they really do need to be bigger (and there is room). I did wear the vest a few times when I didn’t want to carry my Eagle Creek Departure waist pouch (see this post) but needed a place to hide money in an interior pocket and stow my sunglasses. Otherwise the vest was not that useful and since it was hot in India I abandoned it most of the time. Now the good news! I love the Lowepro Street and Field system. 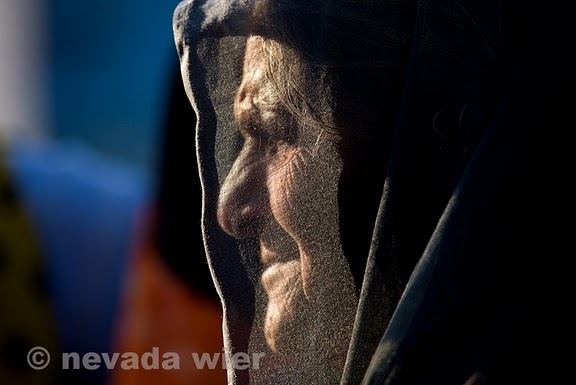 It was perfect for walking around markets and in villages. I brought all my gear over in my trusty Lowepro Orion AW bag (I may have to mount a campaign for Lowepro to resurrect this great camera bag from its discontinued status, join me!) but it was primarily a vessel for my equipment and stayed in the car most of the time. Honestly I usually only needed two lenses: the 16-35m f/2.8 and usually the 24-70mm. Occasionally I also carried the 24mm f/ 1.6 (I love it, so sharp!). I think I only walked around with my 100-400mm f/4.5 a couple of times. So I had 2-3 pouches on the waist belt for the 1-2 lenses and one pouch for flash accessories. I also carried my Garmin GPS and Canon S95 on the belt. In addition, I usually had my converted Canon 5D infrared camera in an older TopLoad Zoom (it is not as bulky as the new ones) slung over a shoulder to my left side. So I still looked armed and dangerous (well, not so dangerous) but all the weight was off my shoulders and my neck. It really was just perfect. I also found that I could slip my Canon 580EX flash into one of the pockets with the Rogue Flashbender – Small Positionable Reflector or LumiQuest FX diffuser and have a workable off-camera flash when I was kneeling and photographing upwards. The new Pocket Wizards Flex TT5 and Mini TT1 Radio Slave for Canon function so much better than the Canon wireless transmitter. Now I’m on my way to Myanmar and am taking the same setup with me. I have some suggestions for Lowepro about the pouches but generally I am really happy with the gear. I have graduated to a soft collar and am beginning to get some movement back in my neck. Bless the healing power of bones, and bless seat belts! I am going to have to design a photo vest though. And, what about the The Perfect Solution for a Crooked-Neck Photographer (sounds like a bird)? True to my hope, the new Lowepro Street & Field system is perfect for my “I’m going light!” plan. I am going to use the Light Utility Belt (I don’t need the heftier S/M Deluxe Belt, plus it barely cinches tight enough and I’m certainly not petite). I have a Slim Lens Pouch 55 (for short lens), a Slim Lens pouch 75 (for long lens) a Quick Flex Pouch 75 (for flash) and a Utility Bag (for accessories). I don’t plan on wearing more than a couple of pouches, but it excellent that I can mix and match. It is all carried in a nifty Transport Duffel Backpack. I have to say that a lot of innovative thinking was put into this system. It is a bit more padded than I like, but it seems like everything is a bit too padded and foamed for my taste. I’ll initially pack all my camera gear in my trusty Orion AW and then chose one or two lenses for wherever I’m going to photograph. I’m rather looking forward to going light. It might become a habit. The TravelSmith Voyager vest was backordered so I never got a good look at it. I had to return the “small” Magellans Travel Vest and for an extra small (Good thing I’m not a petite woman; nothing would fit!). It certainly isn’t a robust photo vest that will hold lenses securely but it will hold flash accessories, filters, money (in a hidden pocket) and other sundry items that a gal (or guy) might need. And it is lightweight! I’ll post a photo in my regalia when I get to India! Oh.. and I got a new fast lens for low-light – the Canon 24mm f/2.4L II USM. I love primes! Originally I was going to try Lowepro’s Slingshot 302AW (since my trusted Orion AW has been discontinued… curses!). But….. I really can’t carry my usual 20-25lbs of gear around all day. I am going to take it all with me but only walk around with a lens or two at a time. I have a number of small shoulder bags but even minimal weight on my shoulder is not a great idea. Luckily Lowepro just came out with a update Street and Field Series. Brilliant! I will use a padded waist-belt that can attach a collapsible (perfect for travel) lens pocket for an extra lens, if I want, and pouches for my flash and accessories. It was a cinch to figure out what pouches I needed (and there are lots of choices!). And, the BlackRapid RS-W1 (yes, they now also have designed one for women) camera strap is so much more comfortable than the usual strap that hangs down on the neck. And, I thought I should bring a photo vest in case I wanted to use that instead of or in tandem with the belt system. This is where I came grinding to a halt, and hours have been spent online. I have a Domke Photo Vest that was “the standard” for years, but even though I have a small size, it is long, huge, and heavy with outdated Khaki fabric. I also have a Royal Robbins Field Guide Vest, (on sale now for $58) which is fine, but too heavy for India. So I started searching and searching and searching online. I looked at Vested Interest: no way was I going to wear a vest with padded pockets, definitely a guy thing. I checked out Humvee Safari Vest but it looks too big and hot (and there was also the Humvee Combat Tactical Vest Khaki Multi Pack!!!!). It became very clear that vests are made primarily for men (not surprising) and they are large, heavy, with a zillion pockets (I begin to lose things when I have too many choices). Actually I thought the BigPockets Tropical Vest ($89) looked the best of all of them; even though it is for birders I think it would also be great for photographers. But it might be more than I really need if I am using the S&F belt. So I thought “Okay, forget about Photo Vests, look at Travel Vests. It may not be able to hold a lens but it can carry money, accessories, sunglasses, etc. That would be good with the Street & Field belt.” So back online for a few more hours. Last year I tried a ScotteVest Travel Vest for Women (a real nifty$100 vest with all kinds of pockets for electronics); but it became clear on the plane that it was going to be too hot for Thailand and India. I couldn’t even wear it in the airports; I was roasting, especially with fleece around the collar. I used to have a great TravelSmith travel vest but I lost it in Laos years ago and of course they don’t make it any longer. The Tilleys Different Drummer Legends Women’s Traveller/Carry-On Vest looks good but it is a $150 and I can’t tell how lightweight it is by the description online (it does say it dries overnight). Yet it is GUARANTEED FOR LIFE NOT TO WEAR OUT. You have to love Tilley products. The TravelSmith Women’s Voyager Vest ($69) looks okay and is a contender at 12 oz (but not sure I need “hand warmer pockets”). Then I saw Magellans Travel Vest for $52 that had the magic word “ultralight” (8oz), doesn’t have a collar, and seems to have all the pockets I would need for access and security. Sot that is what I ordered. After the vest and the Lowepro S&F arrives I’ll give you a thumbs up or down about my choice. And, if you ladies out there have any other suggestions. I’m listening! After what I learned, I want to design my own vest. Someday I’ll get that WierGear rolling! 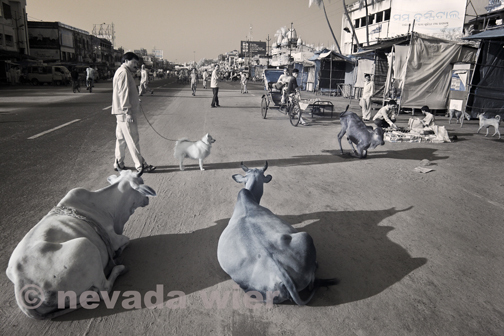 I just received an email asking me about the above image that was in my recent show Outer India at the Verve Gallery in Santa Fe, NM. 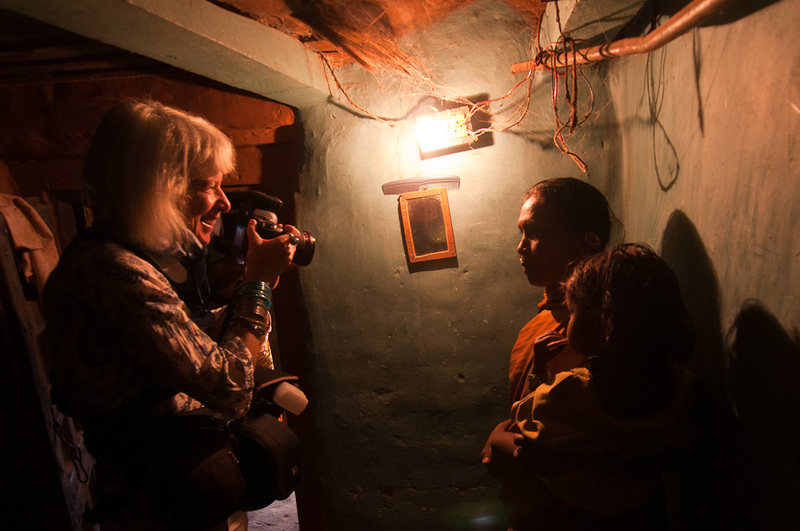 I was leading a National Geographic Expedition to Rajasthan last year (great fun!) and we were photographing on the Sam sand dunes outside of Jaisalmer. It was a beautiful evening and had the good fortune of meeting a caravan of travelers who were willing to spend some time with us on the sand dunes. I photographed wide, long, standing, lying down and then.. said “Lensbaby“! So I pulled out my Lensbaby Composer and starting photographing. I decided to try an panoramic. So I shot a series of images with the idea of merging them. I knew it would be tricky but I did find two images that were clicked seconds apart that worked perfectly when stitched together (I used the miraculous Photomerge in Photoshop CS5). As I have written before, I choose not to crop or change any content in my images, so these are two intact images stitched together. Pretty cool! Otherwise there is no way to create this kind of double selective focus. I could have achieved this with a tilt-shift lens but I find the Lensbaby works best in motion situations. I love it when what I see is a catalyst for a creative image. Check out this post I wrote for the Singh-Ray blog! “Traveling the back roads and narrow trails of Asia, Africa and South America for hours at a time to reach the world’s most remote tribal areas and cultures gives National Geographic photographerNevada Wier plenty of time to think about the gear she takes with her… what stuff is important and what might not be. “Believe me, my filters are important. In particular three kinds of Singh-Ray filters go with me everywhere. There’s a Hi-Lux filter on each of my lenses, and I also carry a 77mm LB Warming Polarizer and a 77mm Vari-ND filter. Each one of these filters is essential and fits neatly in my camera bag that I have to carry around all day. “I keep a Hi-Lux UV filter on each lens because I want the best possible glass between my lens and the world. I photograph in extreme elemental conditions — rain, snow, fog, hot days, cold nights… you name it. I’ve learned the importance of protecting my valuable lenses. However, I do not want a filter that degrades my image quality so I always go with the Hi-Lux. My last post was about how I unpacked my gear. Well, I’ve packed it all up again and am now in Bangkok on my way to Northern Thailand to photograph a few of the hill tribe New Year celebrations. You can refer back to older posts about how I pack my gear (and in a future post I’ll post some more photos about how I pack my camera bag, but I just can’t at the moment as I’m about ready to get on a flight to Chiang Mai.). So what is the most important photo item that I packed besides my camera and CF cards (duh!). Drum roll — Advil! For all the gear I carry. I consider myself a Professional Packer, since I seem to do it all the time. Packing and unpacking. In previous blog posts I have discussed what gear I take on international trips and how I pack all my photographic equipment (and I have my equipment list on my website). Now I’m home after two months of travel and I have to unpack it all (while thinking of two upcoming trips). I hate unpacking, really hate it. First I throw everything out of the suitcases onto my living room floor and begin dividing it into laundry, photo equipment, gifts and personal purchases, toiletries, and “other stuff”. It takes days for my living room to look normal. I returned this recent Monday night and it is now Thursday and the floor is still covered with stuff; I would rather write a blog post. And, hey there is lots to do (she says with emphasis) — copious emails to respond it, mail to read, movies to watch, and friends to see. Plenty of reasons to procrastinate these chores. Eventually I will see my living room floor again, probably by tomorrow. The last thing involved in the Great Unpacking is the most important and the most time consuming the The Big Camera Cleaning: cleaning, examining and organizing my camera and computer equipment. Note: It is now Saturday and I’m getting ready…. First: (and this happens first thing the day I get home) I download my images from my portable hard drives into my Drobo and Backup drive located in The Grayroom, my editing office (just some of the walls are painted 18% gray). 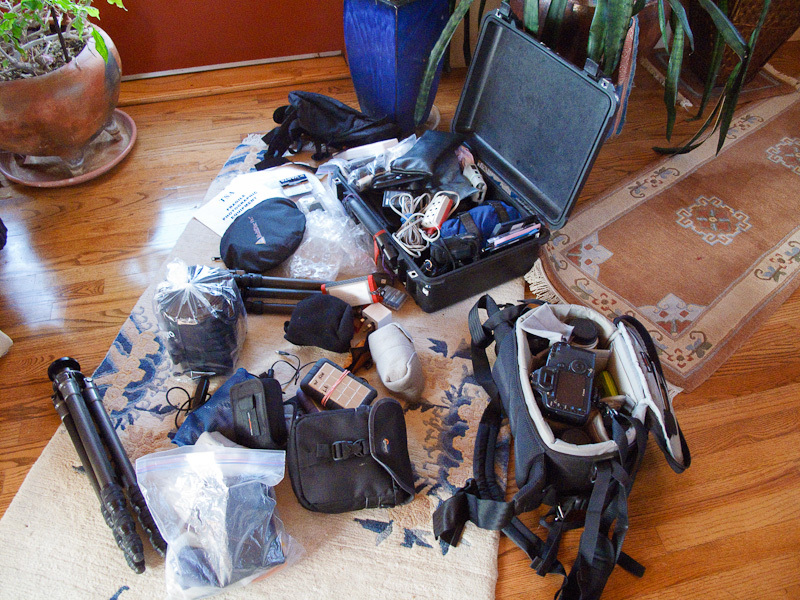 Second: I unload everything from my camera bags and line up the lenses, filters, cameras, flashes, etc. on a table to be cleaned (more on this in a bit). I check all the camera bag pockets and make sure nothing is inside. I then put the camera bags in the washing machine on the gentle cycle. Yep, I wash them with Woolite or Ivory Snow — as well as the tripod bag, camera straps, lens cloths, and anything else that can be washed. I have never ruined a camera bag in the washing machine yet, but I do pay attention during the spin. I air dry the bags. 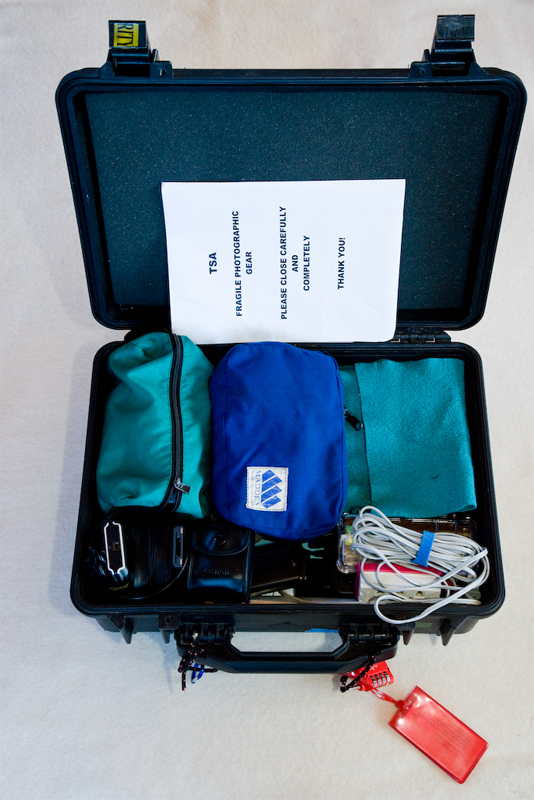 I then scrub out my Pelican hard case, in the bathtub, which holds my extra gear. Note on using a washing machine: Obviously, this is at your own risk. I have never destroyed a bag but I take off all the straps and am careful about how I place it in the washing machine (I have a top loader). I first run the water and then turn off the washer, by hand I push it up and down to clean out the insides, then on Gentle Cycle I run the machine. I pay attention to when the Spin begins and only let it go for a minute or put it on low spin. Then I put the bag(s) out in the New Mexico sun to dry or let it dry for a couple of days inside. Third: I check all my accessories (wires, chargers, batteries, etc.) and make a list of anything that needs to be replenished, replaced, or fixed and then put them back in my much battered, yet clean, Pelican case — ready for the next trip. 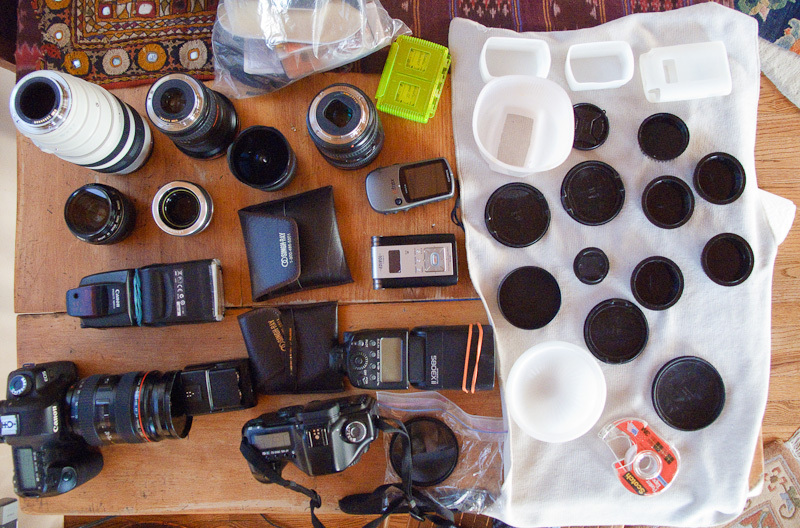 Fourth: I throughly clean all my lenses, cameras, filters, flashes, and absolutely anything that needs to be cleaned. And, this includes cleaning the sensors with Visible Dust Arctic Butterfly if necessary. I wipe them with damp cloths, use q-tips in the buttons, and examine them to see if any dust is inside the lenses. I clean all filters and check for scratches. I clean the sensors. This time I will probably send my cameras off to CPS (Canon Pro Services) to be cleaned and checked since I used these cameras in tough elemental conditions and they took a few knocks; I usually have my cameras and some lenses checked every year. I don’t just use my cameras; I abuse them. I clean everything. I watch TV or a movie while I do this; and I do it during the day so I can examine everything in strong sunlight. After all the cameras and lenses are clean I check the mirrors, focusing screens, and sensors of each camera. I use Visible Dust products. I check them with first with a loupe and then use a full sensor Arctic Brush if necessary. I don’t use swabs unless absolutely necessary (this is rare). I have a separate brush for cleaning the focusing screen. Sunday Dec 13th Note: I put double-sided Scotch tape on the inside of all the back-caps of my lenses to help catch dust before the lens is inserted inside the camera. During this cleanup I take off the tape (and it does catch a lot of dust; I change my lenses often in the field), and put all the lens caps (front & back), strobe diffusers, etc. in a warm water bath and scrub them with a brush, then air dry. After all the lenses are clean I put new double sided Scotch tape back in the inside of the back caps. I also replace the Hoodsman LCD protectors I use on my cameras. Fifth: I check the focusing on my lenses. First by checking them at f/8 — I put the camera on a tripod and focus on sharp type (lock up the mirror and use a cable release). If they aren’t sharp at f/8… they need help. And, then I use LensAlign to see how badly they are front and back focusing. (Read the article on Luminous Landscape about this nifty device). Sixth: I order replacements and other gear I need from B&H. Seventh: I lock everything away in my Camera Room (yes, my gear has it’s own room that stays locked) and am assured it is ready for an assignment or anything that could come up unexpectedly. As of now… the hard drives are unloaded, laundry is done, but I have to pick up all those other pesky items laying about … and then I start the Big Camera Cleaning. And it must be this weekend, because I’m leaving again December 16th. Packing and Unpacking. This is my life as a photographer. Oh, I’ll edit those 15,000 images someday also. I’m on my final flight to New Delhi. I never bemoan long flights because I enjoy the time to read and revel in the fact that I’m not on a steamer ship (plus I use my frequent flier miles to upgrade to business class). Last year I wrote about Packing Camera Gear for Flights which is still relevant (see below for the new luggage in which I put the Pelican case for flights). So this time I thought I would mention a few travel and photo items that might interest you. No one will ever convince me that digital photography is less expensive than film. Sure, I don’t have to carry around hundreds of rolls of film but I do bring an abundance of hard drives, accessories and wires. Since I have seen almost everything fail that can fail, I quake with paranoia. All it takes is one bitty wire to break down a system. Therefore I have to bring backups of usb, mini usb, micro usb, firewire 400, firewire 800, firewire 400 to 800, ipod cords, adapters, and endless power chargers. And, all those cords take up lots of room. Thanks to an article in MacWorld a few months ago Shrinking your Mobile World, I was spurred on to abandon my long cords supplied with the devices and search for short ones (sadly short cords are not less expensive, au contraire). The links on the MacWorld site helped but finding short firewire cords wasn’t that simple. Finally I stumbled upon www.usbfirewire.com. And here are some of the wires I’m bring with me. None are over 9″ except the usb extension cord in case I do need a long one. I love them! I also found a great travel vest from Scotte Vest. This is not a photo vest but a vest to be worn on planes and other travel situations. It is very evolved and even has little cards in each pocket explaining how it can be used. There are conduits in the vest for ipod cords, a clip for a micro cleaner cloth, hidden pockets for change, etc. At first I thought there were too many pockets but at least they are all slim lined and not bulky. However, it is definitely not made for tropical weather. I was roasting inside the Bangkok airport (and it is air-conditioned). I will have to reluctantly abandon it for the rest of my travels in India and Myanmar. Pity… maybe they will make a tropical one soon! I also like that they are tapered differently for women and men. Someday I’m going to design the perfect lightweight photo vest, because I have tried and rejected all of them. Stay tuned for WierGear — a series of unpadded, lightweight stuff that we all need! … Now I’m in New Delhi; jetlagged and up at 5am to finish this blog post. I had to take the vest off in the New Delhi airport and it is packed away for my return international flight in December. It certainly will be cool enough at that time to wear it. I swear by it because it means that it is always hooked to my belt so I yet to lose a passport, money, and I always have a sundry of small useful items with me. Plus it fits under my camera bag waist strap so it is hidden away from searching fingers. Look at all the stuff that fits in it! (I have an older model but the new ones look similar). I’ve spread it out on my bed for you and I think it is quite impressive! Yes, that is a small bag of hot red chili because I can’t live without it (although it does seem strange that I have add chili to India food but they never believe me that I like it really spicy). And I keep a compass, flashlight, and Purell on that small carabiner swinging from the pouch; children covet it. I have been a BIG fan of Eagle Creek stuff since they first began as a small company eons ago. So while I’m on the subject of Eagle Creek — I purchased (yes, the world does not shower me with free gear) for this trip two new bags. One is the new HC2 Hovercraft Upright 25 which fits my Pelican Case (plus other stuff) perfectly; it is rigid enough to protect it for international flights. And a new carry-on roller since I had utterly destroyed the last one and even duct tape wasn’t doing the job any longer — the HC2 Hovercraft Upright 22. Yep, my Lowepro Orion fits inside as well as two extra camera bodies, an extra lens, 2 Rugged Lacie harddrives, a jacket and other stuff. I just wish I had gotten blue ones instead of black because everyone has black luggage and it would be easier to identify off the luggage carousel. So instead I have electric blue luggage tags. And, last year I purchased the HC2 Hovercraft Duffel 30 for my clothes since it is lighter, a bit bigger, and less rigid than the Upright but it still has those magic wheels. Another essential travel item is a flat sink stopper and powdered Ivory Snow because I refuse to pay for outrageously priced hotel laundry. Finally, I have decided that an Amazon Kindle is a worthy purchase (wish I had the new International one). I am a voracious reader so bringing books on trips has always been a weight issue. Now all I have to worry about is not losing the power cord! And I’m off to Jodphur tomorrow. I’m thrilled to be out photographing again soon! More blog posts to come. The Santa Fe Workshops recently started offering mentorships with a select group of professional photographers. It is a brilliant concept, for photographers who want to work in depth or have a consultation with a particular professional photographer. (Check it out http://www.santafeworkshops.com/mentorships/). I recently had a one-hour conversation with Deigh Bates (http://deighlight.wordpress.com/) about his photography. I thought I was an interesting choice for him as a Mentor since he is primarily a landscape photographer and I am primarily a people photographer. But he was looking for a different perspective outside the nature crowd. And, I certainly have a different perspective. I thoroughly enjoyed our conversation and it got me thinking about a number of topics. One of which is … tripods. I rarely use a tripod, except when it is absolutely necessary. Nature photographers tend to gasp when I say that they use the tripod too much or that depth of field is not that important. Tripods are limiting and people tend to get stuck photographing from whatever height and angle in which they set it up. I find that people do not experiment with creative angles, such laying on the ground and shooting upwards, or getting up higher than their tripod can reach, or experimenting with different tilts of the camera. I find that people just get stuck in “shoulds” when that tripod is set up. And, one of those “shoulds” is that most everything should be in-focus. This “should” extends far beyond nature photography. It appears to be primarily a concern for western-culture photographers. I am not exactly sure where it comes from since the early photography is quite dreamy; I think it has to do with the advent of instantmatic cameras like the Brownie (I would love to have your thoughts on this). Of course, not all nature photography is f/16 and beyond; plenty of photographers experiment with “selective” focus but primarily with flowers and details and water. And, there are some spectacular nature photographers like William Neill http://www.williamneill.com/ and Eddie Soloway http://www.eddiesoloway.com/, who push their imagery into new directions. I just would like to see more emerging nature photographers let go of conventional moorings and experiment A LOT. Goggle “bokeh” and start photographing what you imagine, not just what you see. I will have more to say about my conversation with Deigh in future posts because I think he has an extraordinarily open mind. And, he photographs almost every day in his environs (that beats my commitment to photography!). His dedication and photography are exemplatory! I applaud him. A final word about tripods: Yes, I rarely use a tripod; however, I know intimately that it is not enough to up the ISO on the camera (a digital photography crutch); sometimes I REALLY need the tripod to avoid camera shake and occasionally for a particular depth-of-field that I cannot get handholding the image… just like I used to shoot with film. 95% hand-held, and 5% tripod. For the main international flights I put my LowePro Orion AW bag inside a regulation size Eagle Creek Hovercraft Upright 22″ roller carry-on that also holds my hard drives, extra camera body, camera charger, and such. I take all my little accessories out of my camera bag and put them in a separate pouch so it fits and it is also simplier if they ask to look inside my camera bag. I carry the a Lowepro Tropolis 1250 as my “briefcase ” with my computer, wallet, and things I need on the flight (contact solution, book, magazines, food, back and neck pillows, sleeping pills, etc.). I want to make sure that if my luggage is delayed or (horrors!) lost that I can step off the plane and begin photographing. So don’t forget to hand carry your camera charger! For my extra flash, filters, camera and battery chargers, extra cords, sensor cleaning stuff, and a myraid of other accessories (see my website for the entire list)– I pack them inside a medium-sized Pelican 1520 case (with all the inserts removed) and put it inside an Eagle Creek Hovercraft Upright 25″ or a duffel padded by all my clothes and such. (Note: I sometimes use smaller Pelican cases; it depends on the trip. However the 1520 is the one I use the most often.) There is no way I can hand-carry all my gear these days, and this is a workable solution for me. I put a nice note inside saying “TSA. 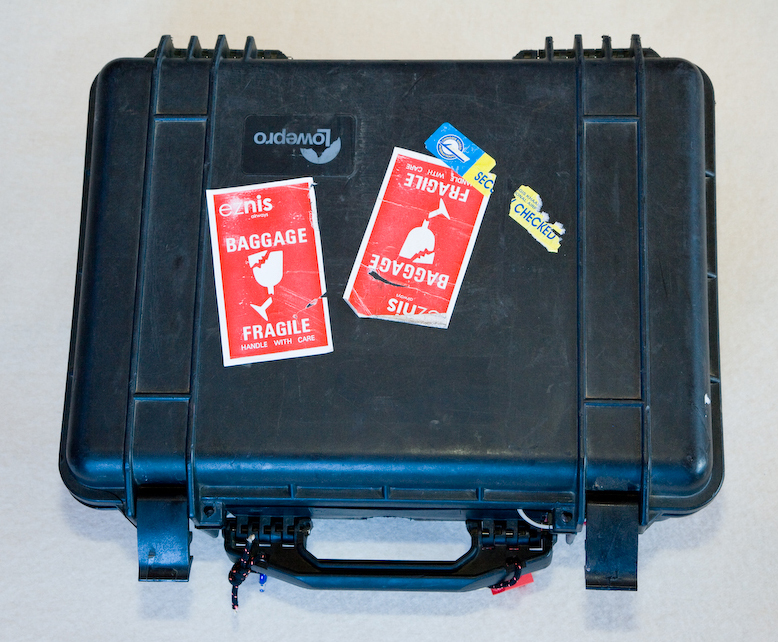 Fragile Photo Gear. Please close carefully and completely”. I assume they will look inside, which they do 50% of the time. I use TSA locks on my checked luggage. Occasionally I will check this hard case as luggage for short flights or it can be hand carried onto a plane. I also pack my tripod in my luggage (I hand hold 95% of my shots).